Between Jan and April 2019 renovation work will be carried out in the public areas and restaurant/bar. During this time, all services will provided as usual in an alternate space within the hotel. Choose the best room for your stay with views over the city of Porto. 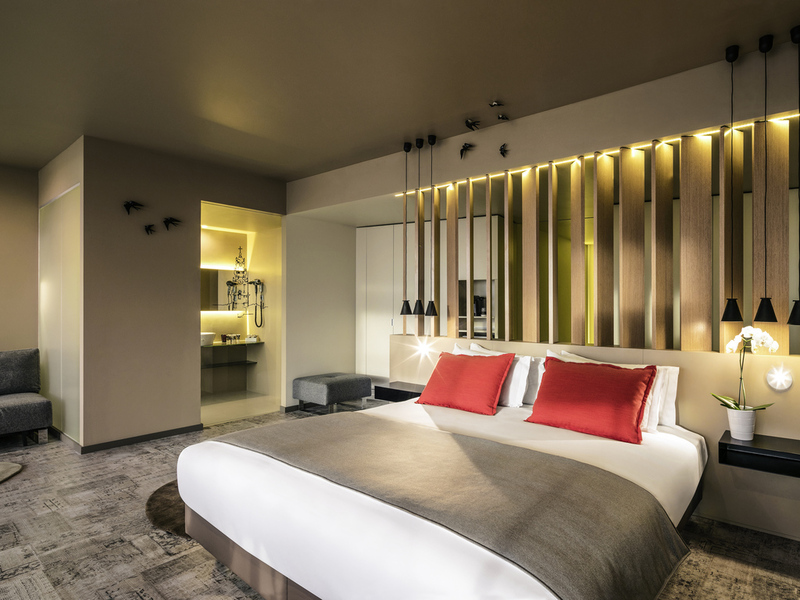 Choose between our Standard Rooms for one or two people and our Privilege Rooms with a wider range of services and modern decor. For an unforgettable experience, stay in our Superior Suite for up to three people with a bedroom and a lounge. The Mercure Porto Centro hotel also has six rooms adapted for people with reduced mobility. The "Tribuna" restaurant serves you the best of traditional Portuguese cuisine in a distinctive and welcoming atmosphere, offering you wonderful views over the old city. With its theatrical theme, it supplies the comfort you need for your relaxation time and/or professional meetings. It was very nice to stay in your hotel. The room was very nice, clean and comfortable. The hotel stuff were very nice and so was breakfast. Nice room, good comfortable bed, nice bathroom. Bad point was a noisy mini-bar fridge but unplugging that sorted it. The seagulls coming to say hello by tapping on the window was highly amusing!! Would like to see the new bar area when it’s complete, but the temporary facilities on the first floor were fine. The staff are all very friendly and helpful, smiling and greeting us each time we passed reception, keep it up!! Comfortable clean room. Friendly and helpful staff. Central location near the main train station and Porto centre. Big rooms made us very comfortable and so cozy it was hard to get the kids out of the room for sightseeing. The location is supreme, the recommended restaurants were really great picks. as usual, nice room, clean. bar and restaurant ok even during the renovation. Hotel is of decent quality, location of hotel was good, quiet area with eateries just a few steps away. Staff at the reception are friendly and helpful. Room quality is just average though, I felt the room is a little too dim, there should be more lights installed so guests can have the option to turn on / off those lights if they prefer dimmer / well-lit room. Sadly the pipes under the water basin of our room was leaking, we did not have the time to ask for maintenance as we are out during the day and do not like visitors when we are not in. Bedroom slippers are only available to0 Accor members. During a stay at this very nice hotel in a very nice city, I was unfortunately taken very ill. Hotel staff were unbelievably helpful and professional, finding medical assistance very quickly in the middle of the night. Nice hotel with good amenities. Enjoyed the breakfast. Hotel was clean. Staff was uniformly friendly and helpful. The hotel is placed very central in Porto with short distances to attractions. The room was very clean and the hotel staff was always very friendly. From the moment we arrived at the hotel the staff were absolutely 1st class. Every member of staff we encountered were fantastic. A special mention to (Marco .. I think?..) who checked us in. We arrived early and he was fantastic. I requested the best room available (within what we had paid for) because it was a special occasion. We were very happy with the room the staff gave us with great views of the city. Unfortunately some of the amenities let the hotel down. The bar was makeshift at best, 3 tables for seating and the actual bar was a few tables pushed together with a table cloth over them... they are doing some building work on the hotel so I assume the real bar area is coming. The air conditioning wasn’t very efficient and was extremely loud and surprisingly we didn’t get any complementary water for the room, which was a first for me with Accor. Finally the selection of complementary drinks for Accor members was “everything except Wine, Spirits and Champagne” .... not leaving much choice except Beer or Port! Again this was disappointing and a first with my experience with Accor hotels loyalty drinks. All in all it was a very medicore stay and was only saved by the staff and location. Hotel is comfortable and very near to the major attractions and train station. We were pleasantly surprised as our room was upgraded to a superior room. The hotel is very central making it easier for us to go around and discover Porto. Both the room and the bathroom were very spacious and well kept. We would recommend this hotel to other persons without any hesitation. Helpful staff but a few issues. The location was good and the staff were helpful. Our room (Privilege) had air conditioning which didn't work, no kettle (as stated in the description), no tea bags and a shortage of clothes hangers. Otherwise the room was fine and clean and the bathroom was spacious. We spoke to reception who sent house-keeping up with the kettle etc and she checked the air-con which was 'working'. It was doing something but not producing cold air so at night it was hot and stuffy and when we opened the window we could hear early morning announcements from the station below. We complained again and were moved to another room where the air-con worked. When I booked directly with Accor, I didn't see (or it wasn't mentioned) that the downstairs restaurant, bar etc were being refurbished so breakfast was served in smaller rooms upstairs. On two mornings this was fine, but on four it wasn't as a very larger group was in who filled the place up and frankly, stripped the buffet. One morning there were no cups/mugs for hot drinks, they ran out of scrambled eggs, jam, croissants etc. Again, the staff were helpful and if you could grab one and ask for something they would fetch it out for you. We stayed for 7 nights and it was a lovely experience. Your staff made the stay enjoyable and are always ready to answer that 100th question that they must get every day with a smile. Great location, great staff (they gave us some good tips for dinner), pretty good breakfast, good shower (even though in bathtub..) - horribly hard beds unfortunately, didn't sleep much in the end due to this. I got an upgrade of the room to a privileged room. Really comfortable room and corresponding to my preferences, far from the elevator and on the higher levels.